Pulled hamstring, two days before the season started. Slightly hyper-extended right knee, that resulted in me not walking for two days. Deep thigh contusion on my right quad. Re-dislocated pinky finger on right hand. I did this in warm-ups! 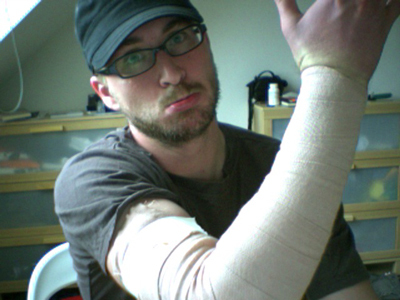 Said contusion feels as if it has developed into a quad strain. note: Bottle of Advil over my left shoulder for swelling! Love it! Be careful bro… Girls… Women… Can be pretty tough! Come on you’ve watched two kids arrive into this world. Tough. We couldn’t do that! Pray you’re doing well!